Michael Bay seems to get a bad rap. The director who began making feature films all the way back in 1995 with Bad Boys is often lambasted as being one of the worst filmmakers currently working in Hollywood. It’s easy to see why some people have given him this label, especially when you take into account the fact that he directed all four of the terrible Transformers films. But even if his filmography is filled with quite a few stinkers, at least the guy has a unique style that separates some of his smaller films from a lot of the incredibly bland action movies that come out year after year. 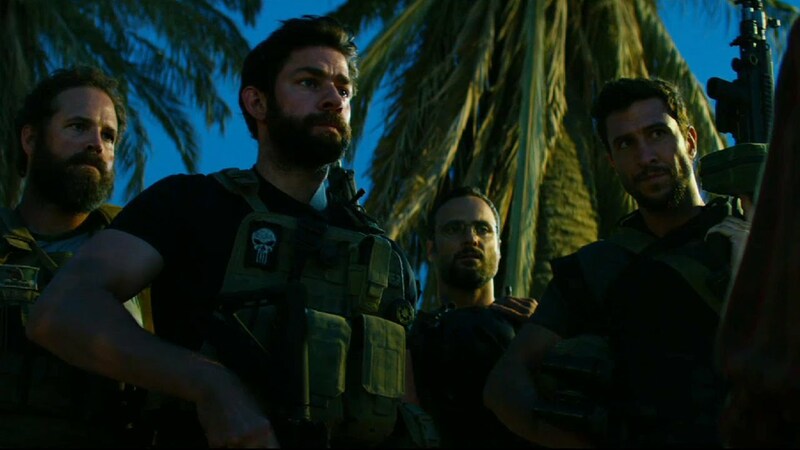 His latest, 13 Hours: The Secret Soldiers of Benghazi, is a step in the right direction; Bay’s style is always apparent, but here it’s somewhat tempered. This leads to a serviceable true story action flick which proves that Bay is certainly not the worst director out there. The year is 2012 and Benghazi is one of the most dangerous places on earth. A group of six CIA security contractors are sent into the danger zone in order to protect an American consulate. The newest member of the team is Jack Da Silva (John Krasinski), who is having trouble dealing with the fact that he’s left his family behind back home. A U.S. ambassador also arrives in Benghazi and is staying at a nearby security compound. But soon the compound is under attack and the six men are forced to step in and fight off dozens of enemies with no help in sight. I’m certainly no expert when it comes to the Benghazi incident, but I think it’s safe to say that Bay and the screenplay from Chuck Hogan take certain liberties when it comes to its storytelling. That’s completely fine, but one would hope that if the film doesn’t feel realistically accurate, it would at least work as a compelling action flick. But the action in 13 Hours isn’t very memorable and it begins to feel repetitive, especially in the film’s third act. This is far from Bay’s worst action and it’s nowhere near as mindless as his Transformers films, but the never-ending firefights quickly grow tiresome. It also doesn’t help that the film’s structure and poor pacing make it feel about 45 minutes too long. But there are moments when the film excels, even when you expect it to stumble. It never devolves into the over-the-top, schmaltzy patriotism that you might expect from this kind of film, instead honoring America’s soldiers in a much more quiet and moving fashion. And as the film’s primary protagonist, Krasinski is really quite good here. Breaking away from any typecasting he might have received for his role as Jim on NBC’s The Office, Krasinski is completely believable as a muscular CIA contractor. All of the other performances in the film are serviceable, but it’s really only Krasinski that’s able to standout. This is mostly due to the fact that most of the characters are written as strikingly similar to one another, which never gives the actors the ability to flesh out their performances. Even though the majority of 13 Hours is pretty mediocre, it ends on a surprisingly high note that will leave audiences feeling moved as they leave the theater. This is far from a great film, but Bay is surprisingly competent here and does a fine job honoring fallen soldiers while still using his over-the-top style. With a January release date, the producers were clearly hoping to use this film to capitalize on the success of last year’s American Sniper and while neither film really excels, I would tentatively say that 13 Hours is a better film overall. It’s likely to be completely forgotten by the time the end of the year rolls around, but this is still pretty good for Bay. The Transformers franchise has never aspired to be high art. At their best, these films should be nothing more than fun popcorn entertainment. But every single entry into the series thus far has failed miserably at that. Their stories are so weakly cobbled together and their action is so poorly directed that it’s practically impossible not to mentally zone out in the films’ third acts. Because I had become so bored with these movies in the past, I went into Transformers: Age of Extinction telling myself that I was going to try to follow this story as much as I possibly could, not matter how awful the writing might become. Even if I wanted to shut my brain off and quit attempting to follow a story that has very little logic to it, I told myself that I was going to persevere and watch this thing to the best of my ability. But try as I might, I still couldn’t bring myself to enjoy and understand what was happening in this film. The story is so weakly structured that it eventually falls apart and most of the action sequences are boring and way too similar to battle sequences from the previous films in the franchise. The only entertaining aspect of the film is simply watching a summer blockbuster with a $210 million budget fall flat on its face. It’s been several years since the Autobots and Decepticons fought each other in the heart of Chicago. Now, the Autobots are in hiding and humans who find any suspicious alien activity are urged to report it to the government. Leading the charge to round up the remaining Autobots is CIA Agent Harold Attinger (Kelsey Grammar). Attinger discovers that Optimus Prime is hiding out somewhere in Texas and he sends a tactical unit down to retrieve him. The unit arrives at the home of Cade Yeager (Mark Wahlberg) an inventor and single father to his daughter Tessa (Nicola Peltz). Yeager bought Optimus thinking that he was nothing more than a large truck, but once he found out that he was a Transformer, Yeager attempted to repair him. He tries to hide Optimus from the tactical unit for as long as he can, but eventually Optimus is discovered and Yeager, his daughter and her boyfriend Shane (Jack Reynor) are forced to go on the run. One thing that needs to be said about Age of Extinction is that it’s an improvement over the previous two Transformers films. This isn’t saying much, but this sequel actually has a few things going for it that its predecessors did not. For one thing, the story is actually somewhat tolerable for the majority of the film’s runtime. That’s not saying it’s good, but it’s slightly better than one would expect for a Transformers movie. The plot is tight and competent enough to follow, until the film’s third act when it becomes a jumbled mess of action. Also working in the film’s favor is that this may be a case of so bad it’s good. I found myself consistently entertained, but not in the way that the filmmakers intended. The script by Ehren Kruger is filled with such awful dialogue that it’s amazing that these lines made it into the final product. It feels like Kruger wrote these lines in a first draft with the intention of going back and revising them, but then he just forgot. Perhaps this shouldn’t be considered a positive aspect, but I found myself chuckling at practically everything these characters said to one another. Another thing that had me laughing when I wasn’t supposed to be is the blatantly obvious product placement. It’s ok to have product placement in your movie, but there is a very clear difference between putting a product in your movie and shoving it in your audience’s face. For instance, there’s a scene in the movie where an element called Transformium morphs into a flashy looking pillbox speaker from Beats by Dre. Even more glaring is when Yeager crashes an alien ship into a Bud Light truck. It’s bad enough that they so clearly featured the logo on the truck, but the real kicker is when the camera goes in for a close up on one of the bottles and Yeager proceeds to pop the top off one and take a swig. It was so ridiculous that I couldn’t believe what I was seeing; it still remains the most memorable scene in the entire film. But the products continue to show up in the film’s finale where virtually every other shot features Transformers fighting each other next to a billboard that is placed near the center of the frame and in focus. It’s extremely distracting; instead of watching the climactic fighting, I couldn’t help but pay more attention to the ads that were on display. Why a summer blockbuster that is practically guaranteed to make close to $1 billion worldwide needs to force in so many brand names is beyond me. Maybe this has something to do with director Michael Bay’s past history directing commercials. Love him or hate him, you can’t argue that Bay doesn’t have a distinct style; his excessive use of low angle shots, high key lighting and slow motion effects can be fun when used correctly, but in Age of Extinction Bay uses these trademarks so often that he begins to become a parody of himself. One of his biggest weaknesses is his inability to direct action and most of the sequences here ring hollow. A scene where the characters climb along wires that are suspended hundreds of feet above a city should have been exciting, but it’s so poorly edited that nothing about it feels as exciting as it should. Maybe a bigger problem is that the characters are never fully developed beyond their one note personalities. It’s difficult to care about these characters, so the action sequences lack the suspense that they need. A scene in which we discover that Tessa and Shane are three years apart in age and can only become intimate under a Romeo and Juliet law seems to be an attempt to develop these characters, but it’s a weirdly forced scene that feels out of context with the rest of the film. One thing that can’t be put down is the visual effects, which still manage to stay incredible, even when everything surrounding them is a mess. One would think that the addition of the Dinobots could improve the film significantly, but, alas, those are handled poorly also. Perhaps it’s time for Michael Bay to move on and hand the reins of this franchise over to someone else. He’s had four opportunities to make a decent Transformers film and he’s pretty much failed every single time. This attempt is such an empty cash grab that you can practically hear the echoes of Bay counting his money. It’s a summer blockbuster that’s only tolerable if you view it for its unintentional comedy. I had a lot of fun with Age of Extinction, but for all the wrong reasons.